JJ meter* L-C meter, crystal activity tester, HF-VIIF signal generator, field strength meter, modulation quality checker and absorption wave meter. ♦ . . If this sounds like a whole lab full Of equipment, then wait one. This is only a partial listing of the functions that a good grid dip meter will perform and we haven't even touched on its primary area of usefulness, that of determining the resonant frequency of "cold" tuned circuits and antennas. The GDM-1 covers the range of 1.5 to 300 mc using 6 sturdy, color coded coils which plug into a standard crystal socket mounted vided for monitoring purposes and good results are obtained with the instrument in either the oscillating or non-oscillating mode. Study of the schematic diagram w*ill disclose nothing really new in circuitry, although the AM modulation capability is an additional and very useful feature not found in many other instruments. 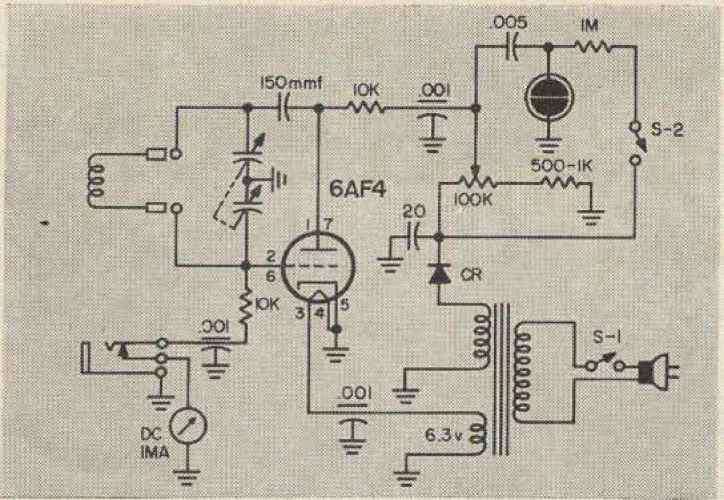 The circuit is a conventional ultra-audion oscillator using a split stator tuning capacitor, A inilliameter is connected in the grid circuit and the plate voltage is made adjustable to control the magnitude of oscillation. This permits setting the grid current to the optimum point on the meter scale. When the grid dip meter coil is coupled to a circuit tuned to the oscillator frequency, it will absorb power, This loss of energy results in a decrease in the magnitude of osc l-lation and is indicated by a reduction in grid current. Therefore, by tuning the instrument for a dip on the meter and reading the frequency from the dial, the resonant frequency of the externa] circuit is quickly determined. of the ALCO instrument is the absolute freedom from spurious responses. Also, with the exception of the lowest frequency range, grid current is uniform across the dial. On the lowest frequency coil, there is a gradual falling of grid current as the low end of the dial is approached. The secret of this performance is shown in the close-up photo of the rf section. All circuit elements are constructed as a compact sub-assembly which results in essentially zero length leads, RC filters using ceramic feed-through capacitors give extremely good circuit isolation of all external leads. The effectiveness of this decoupling is enhanced by the use of a copper plated sub-assembly chassis which gives low resistance grounding of the critica? circuit elements. The instrument gives good performance as a crystal activity checker and as a crystal controlled signal source. Crystal activity is indicated on the meter. Crystals from 200 kt to 20 mc were tested and all oscillated strongly, This and many other applications, including those listed in the lead paragraph, are covered in the instructions. The "Mimeographed in Japan" instructions will get plenty of use and really should be published in more permanent form. Those interested in pursuing the subject further are referred to the excellent book, "IIOW TO USE GRID DIP OSCILLATORS," by burner. This book is available from 73's own Radio Bookshop for a nominal $2.50. In the instrument tested, no deficiencies were noted which affected the performance, One point, however, deserves mention and possible correction in production. 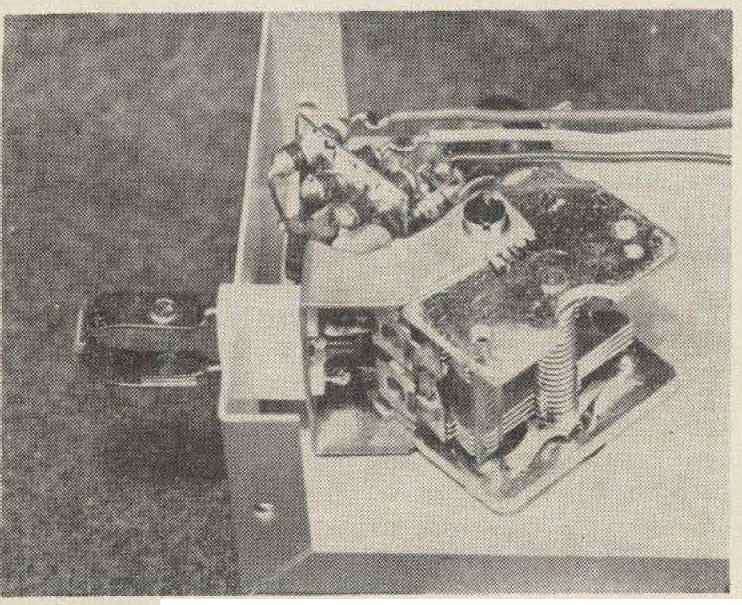 In all except the R F sub-assembly, which is excellent, the assembly and wiring techniques are slightly below commercial instrument standards. This is a minor point but a couple of terminal strips, a foot of lacing twine and ten minutes longer on the production line would turn the present aggregation of lead mounted components and point-to-point wiring into a "MIL Spec" creation. HOW TO CALIBRATE A GRID DIP METER? What is a dip meter amature radio? HOW TO GRID DIP 1/4 WAVE MATCHING SECTION? How to tune am radio with dip meter?